Former Norwich City captain Craig Fleming has retired from football after failing to recover from a long-term ankle injury. After undergoing an operation, the veteran's surgeon has advised him to hang up his boots. Fleming finished his career with non-league King's Lynn after spells at Oldham, Halifax, Rotherham and Wolves. "I'm sad to be finishing but I had no choice," the 37-year-old defender told BBC Radio Norfolk. 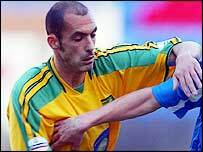 The defender made 382 appearances for Norwich between 1997 and 2007 and was voted player of the season by the fans in 2003-2004 when Norwich won the Division One title. The following season he played in every minute of every game in the Premiership. Fleming was out of favour under former manager Peter Grant and left Norwich after playing in 382 first-team games which puts him at number 12 in the club's all-time list of appearances. The news of Fleming's retirement will not be a big shock to King's Lynn fans who had been deprived of his services since before Christmas. He is a qualified personal trainer and has not ruled out returning to Norwich City in a coaching capacity. "I would love to get involved in coaching in Norfolk because I'm not interested in chasing round the country. "If something cropped up at Norwich City it would be fantastic but if it doesn't I won't chase it."